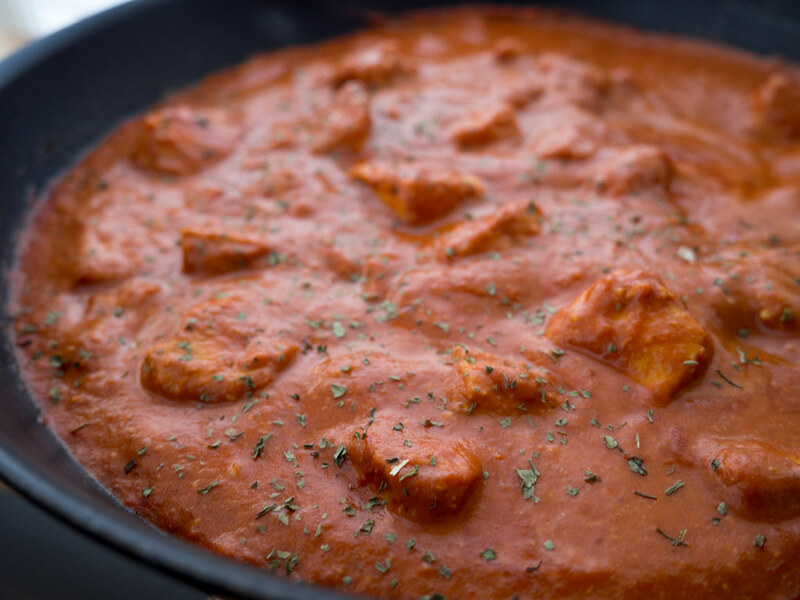 Butter Chicken or Murgh Makhani, as it is called some places, is an Indian dish which was invented at a restaurant in Daryaganj Delhi in India. Even though this dish has its roots on the other side of the planet, far away from the traditional Nordic kitchen, I am still sharing it here on my blog. When I was younger, I was not that happy with foreign and spicy food but after I started to explore the different food the world has to offer, especially the Indian and Asian cuisine, I have learned how to make so many fantastic dishes. From time to time I stumble upon a new kind of food or dish, which I have never had or heard about before but now find very delicious. 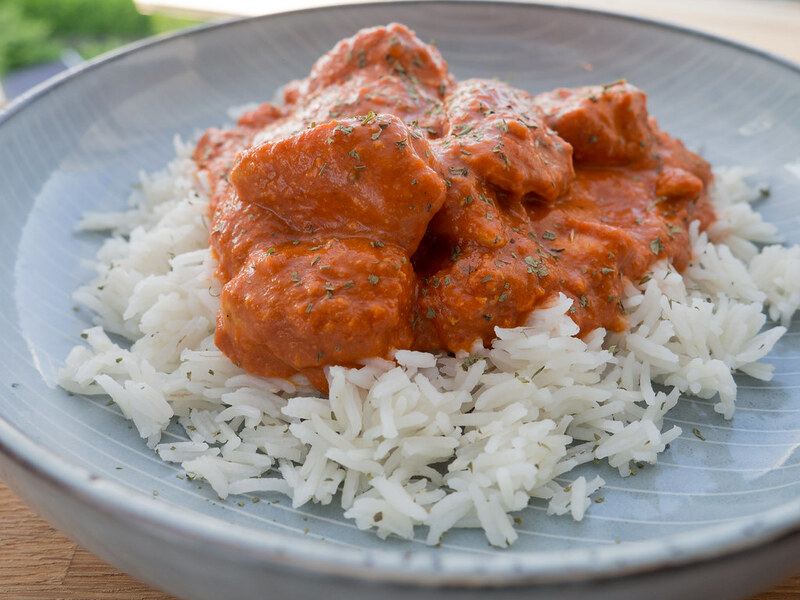 This Butter Chicken, which I am share the recipe for here in this blog post, is one of these wonderful dishes which I have discovered too late in my life. I know that this dish, for some people, is just a ‘normal’ and everyday dish but for me it is a great and new experience in the world of food. I have to admit, the first time I heard about this dish, I thought it was one of these dishes that just taste so good but is too unhealthy to eat on an everyday basis. However, this is not the truth – in this case the name of this dish initially tricked me to think, that is was based on a lot of butter. When I started researching for this dish, I quickly realized that butter is absolutely not the major ingredient as I thought. Actually, this dish is not that unhealthy and it contains protein rich chicken, tomato and of course many delicious and tasteful spices. 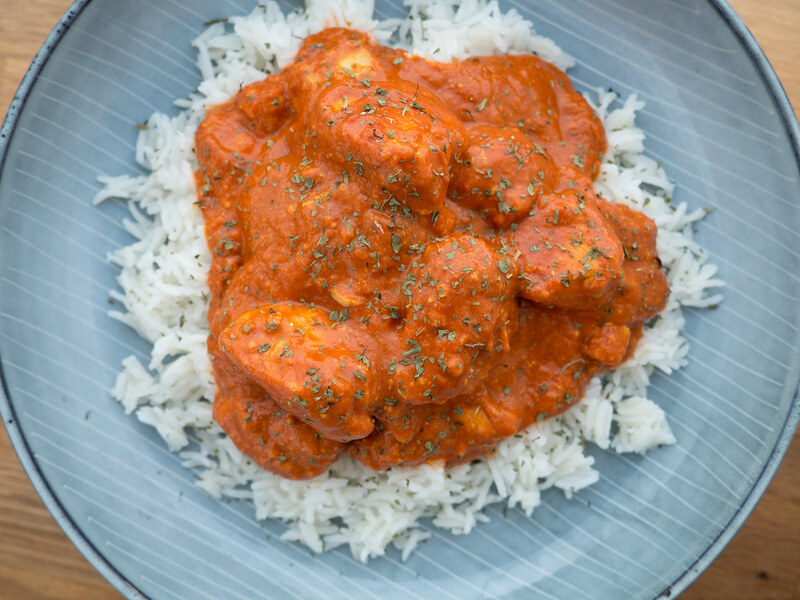 This dish is typically served with white rice or freshly baked Naan bread. I sometimes substitute the white rice with the more healthy brown rice. Brown rice has a greater content of dietary fiber, which is good for your stomach and makes you feel full for a longer time – I personally think the taste is almost the same. This dish is actually quite easy to prepare and does not require you to have any particular skills in the kitchen. 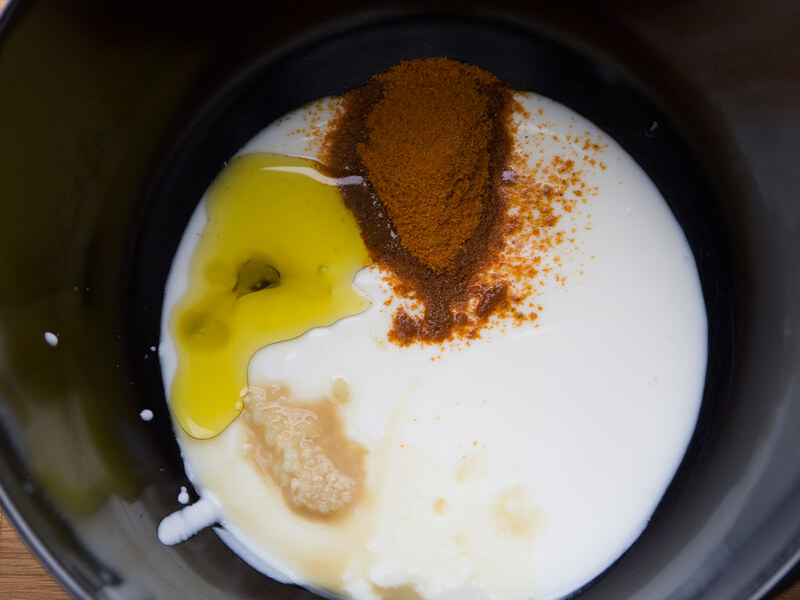 You start by mixing the spices and yogurt for the marinate. 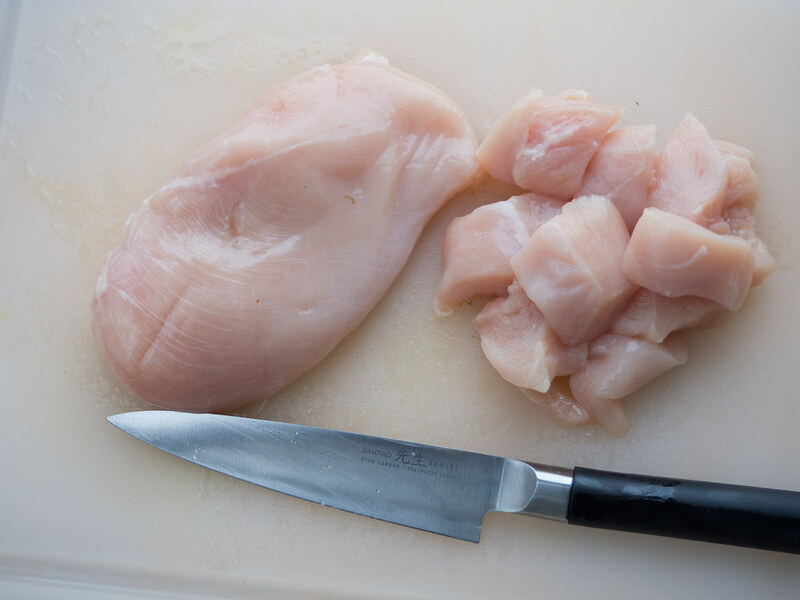 Cut the chicken filet into nice pieces with a size of about 2-3 cm (1 inch). Mix the chicken with marinate and set it aside in the fridge for minimum 20-30 minutes but preferably for 12-24 hours. 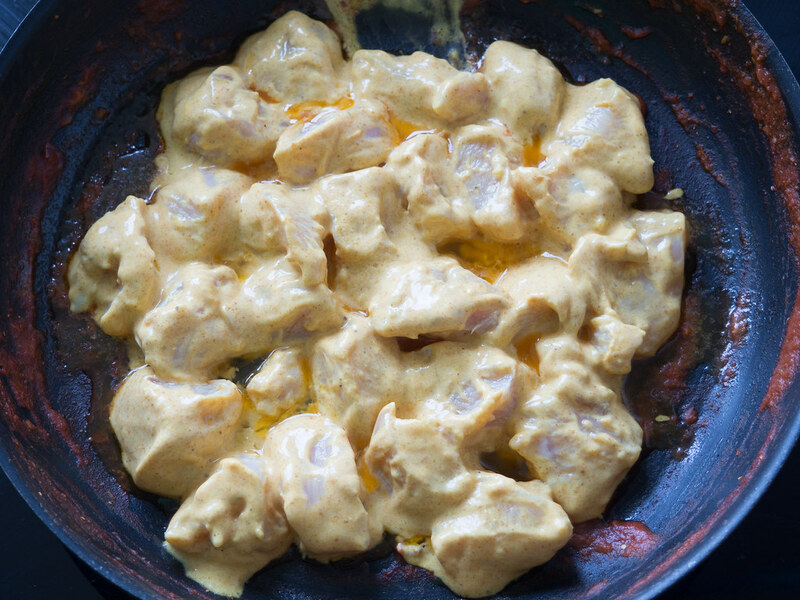 Continue with the curry butter sauce; in a large frying pan add the butter and oil and let it melt. Add the diced onion and sauté for about 5 minutes or until they are translucent. 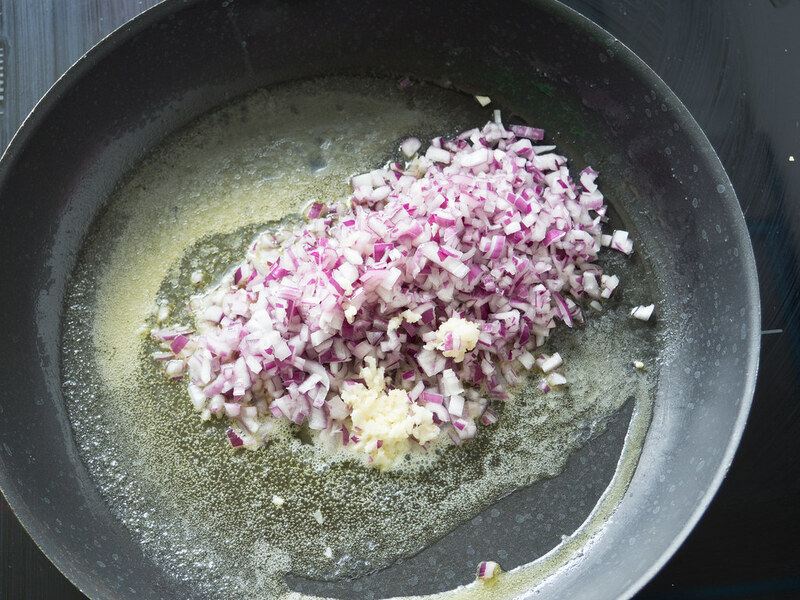 Add the minced garlic and ginger paste (or similar ginger juice), fry for an extra minute. 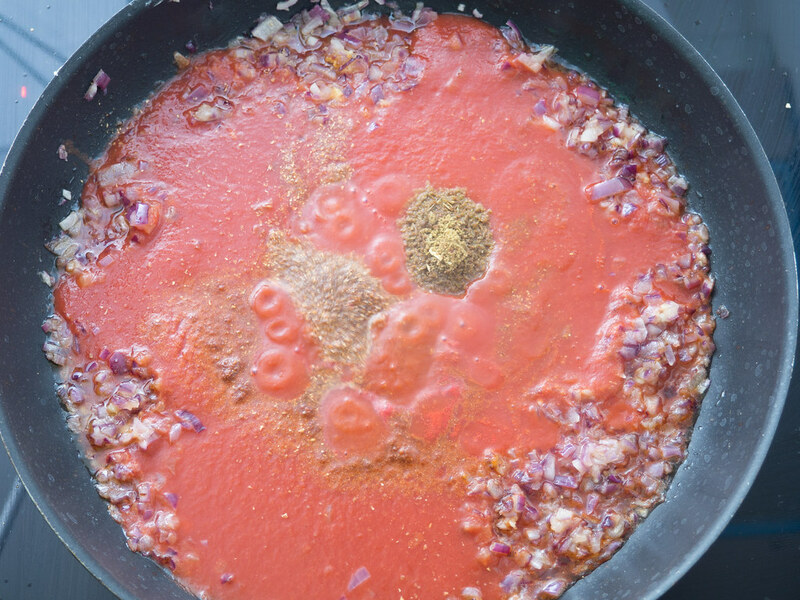 Then add the crushed tomatoes, chili powder, cumin powder and coriander/cilantro powder – continue cooking the tomato sauce for another 5-10 minutes. 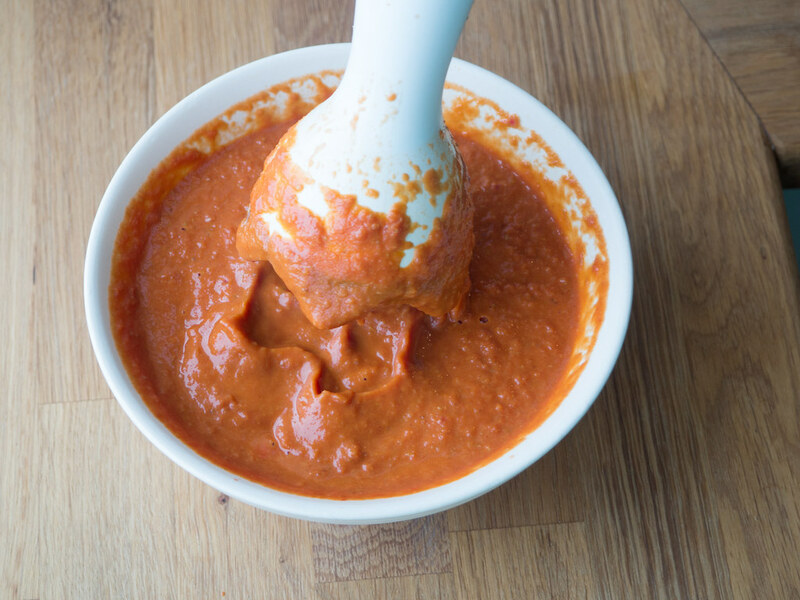 Remove the pan from the heat and then you can either pour the sauce in a blender or use a hand blender directly to blend the sauce into a smooth and uniform tomato sauce. 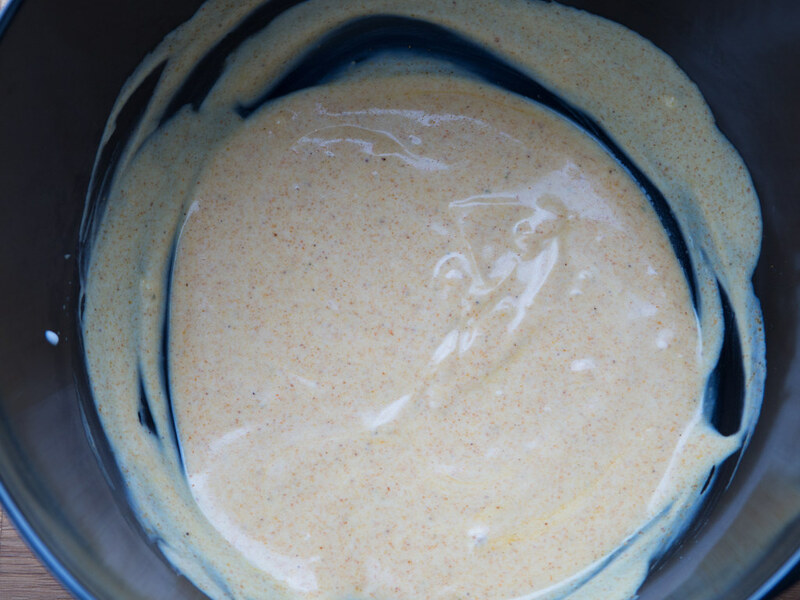 Now, at this point you can decide if you want to refrigerate the sauce up to 48 hour or freeze it for up to 3-4 months. 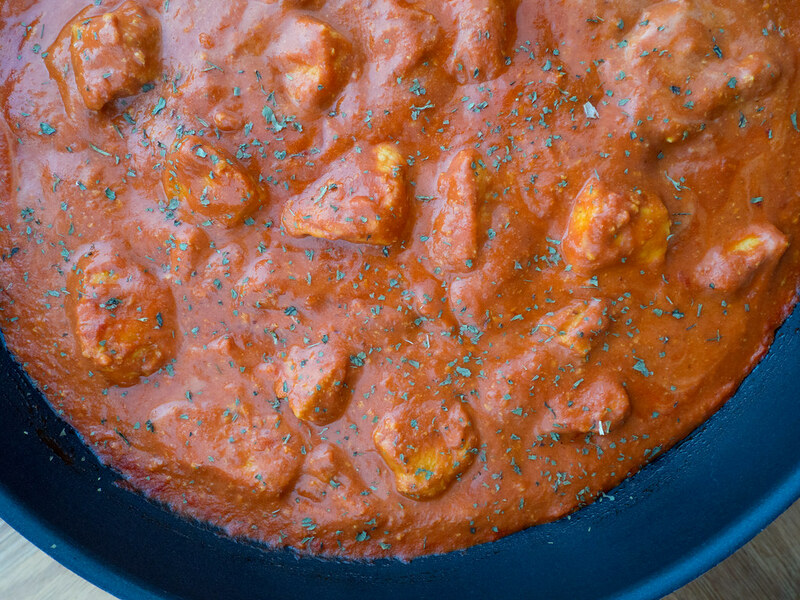 This makes it super easy to make this Butter Chicken easily when you are just looking for some delicious food. In order to continue, add some butter on a frying pan and gently fry the marinated chicken. Discard the extra and superfluous marinate. When the chicken is done, add the blended tomato sauce to the frying pan and then heat it up together with the chicken. 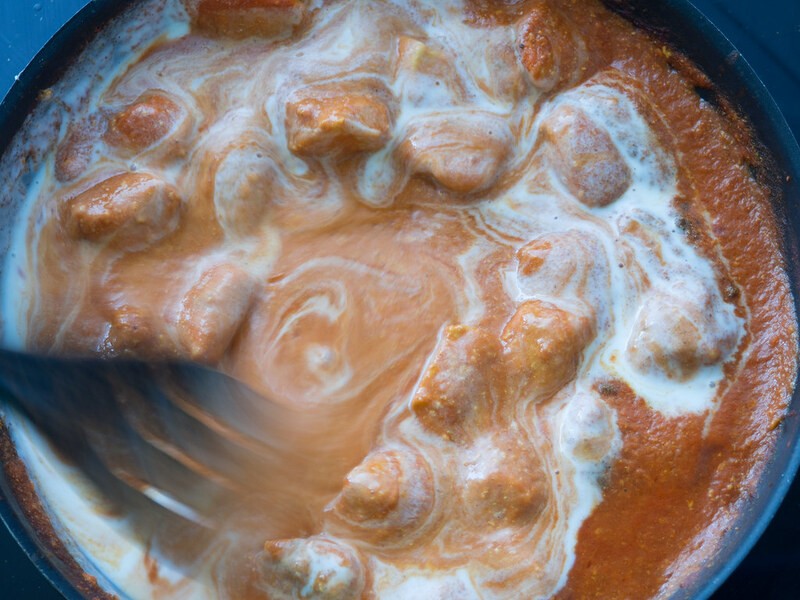 When then sauce, with the chicken, starts to bubble add the heavy cream and Garam Masala and let it all simmer for a couple of minutes. Just before serving the butter chicken add some crushed dried Fenugreek leaves or some fresh and chopped coriander/cilantro leaves. 1. In a bowl; add all the ingredients for the marinade and stir to mix. 2. Cut the chicken breast into bit-sized pieces 2-3 cm (1 inch). 3. 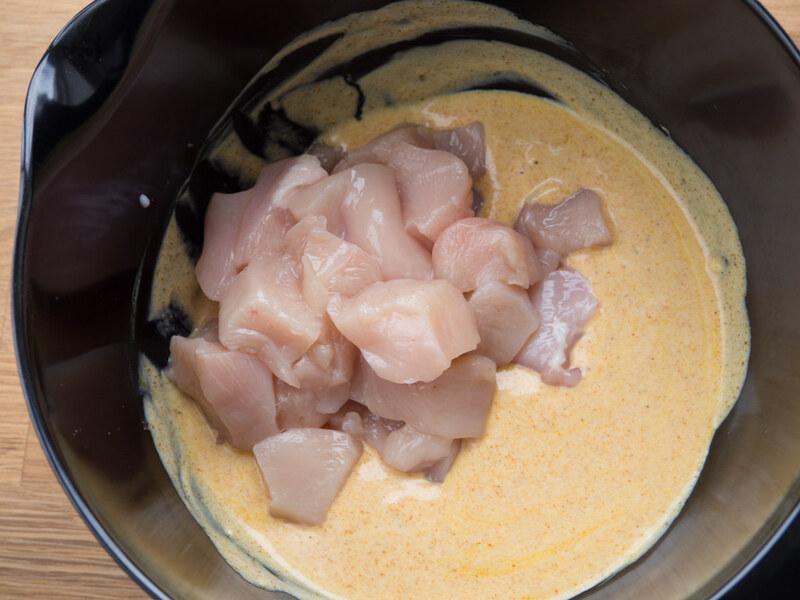 Pour the chicken pieces into the marinade and mix everything together. 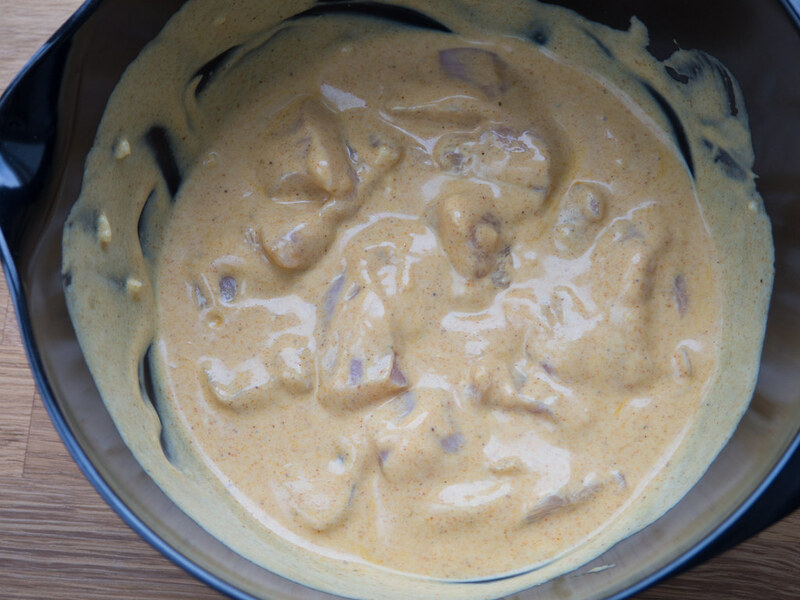 Let the chicken marinade for minimum 20-30 minutes but preferably 12-24 hours in the fridge. The longer you wait; you get a better taste and a more juicy chicken. 4. In a large sauce- or wok pan; add the butter and oil and let it melt at medium heat. 5. Finely dice the onion and mince the garlic. 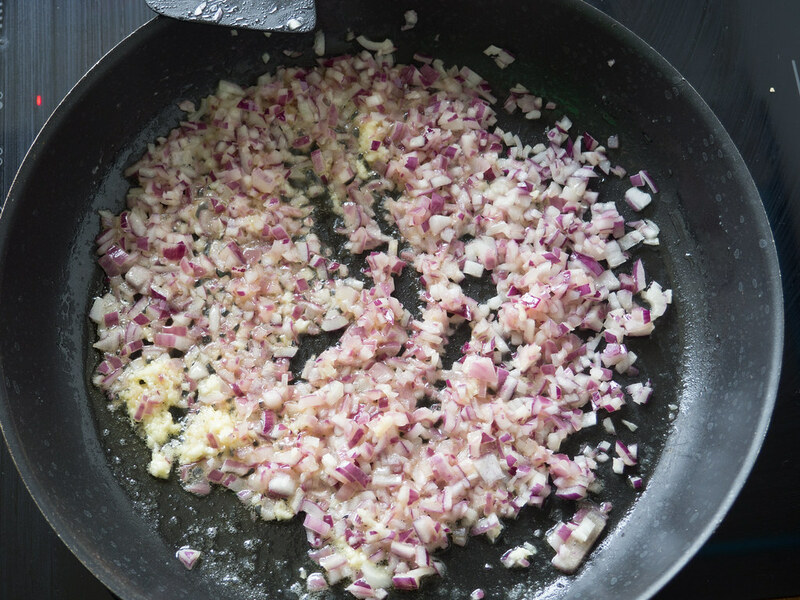 Add both ingredients to the hot pan and fry for a couple of minutes or until the onions are nice and translucent. 6. Add the ginger paste/juice, crushed tomatoes, chili powder, cumin powder and cilantro/coriander powder. Stir and cook for another 5-8 minutes. Try not making the sauce boil but only simmer. 7. 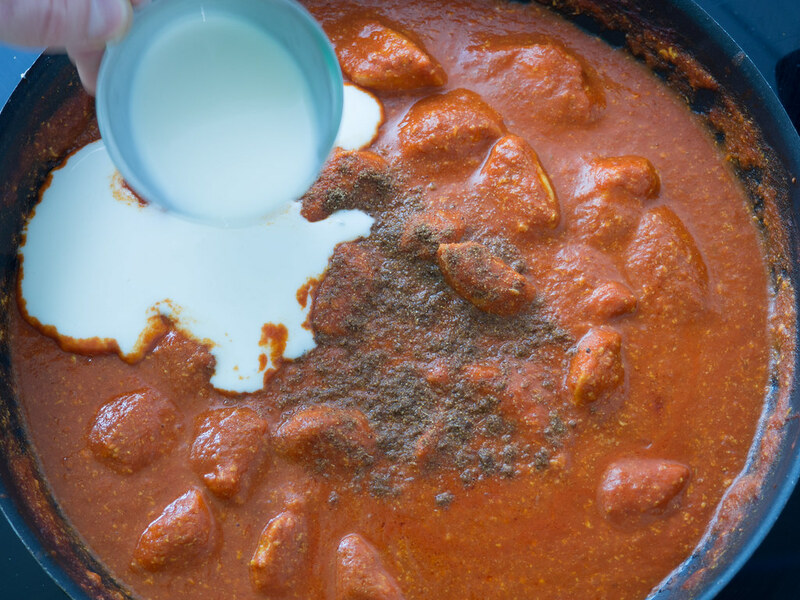 Pour the sauce from the pan into a blender and blend everything into a nice and smooth butter chicken sauce. You can also pour it into a bowl and use a hand blender. 8. On the same and now empty frying pan; add a little butter and gently fry the chicken. The chicken should only be 98 % done. The last cooking of the chicken will be done in the next step. 9. Pour the butter sauce back to the frying pan with the chicken. Let the sauce and chicken heat up under low heat. 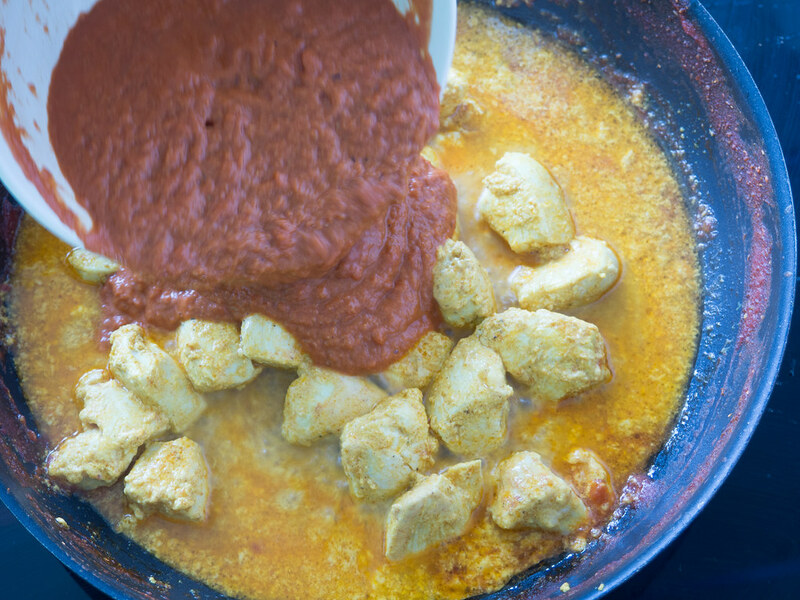 When the sauce starts to boil, add the heavy cream and the Garam Masala spices. 10. Finally, finely chop some fresh coriander or crush some Fernugreek leaves over the sauce in the pan. Serve together with rice or Naan bread.